It’s a suburb with a lot of love to give. On top of being the home of the world’s most awesome old-school milk bar (the Rio has been delighting the inner-west since 1952), Summer Hill is where you’ll find the Drug Store café and the soon-to-swing-open One Penny Red from ex-Neutral Bay Dining’s RJ Lines. But we’re here today to talk Chic Pea. The sometimes-restaurant (it’s in a symbiotic relationship with Plunge Espresso café) is the work of blogger/chef Fouad Kassab and Plunge owner Hesham el Masry. They do a 6.15 and an 8.30pm sitting every Friday and Saturday, offering their spin on Middle Eastern classics. It’s a smart idea, piggybacking the business like that - we’d love to see more cafés doing likewise in the evenings. Ordering-wise, there are two ways to go here. There’s the $60 tasting (you’ll need a minimum of two people to rock ’n’ roll), or you can just order à la blackboard and choose your own adventure. There’s almond and potato bread to start – a severe little bun, best described as dense. 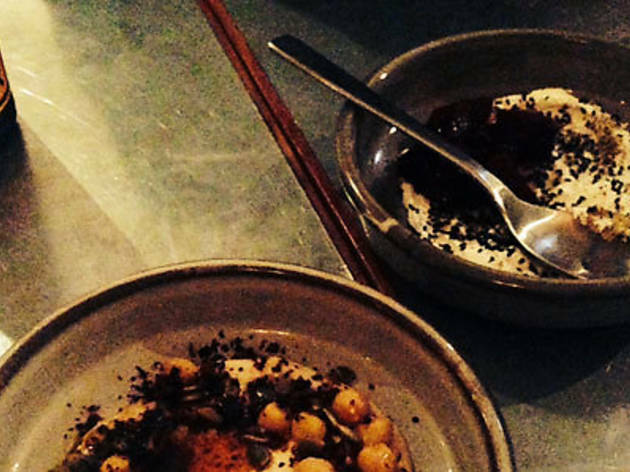 Add $2 for a serve of Pepe Saya butter sprinkled with dukkah, or just do as we do and use it to dip into the shallow dishes of labne dotted with toasted black sesame and roasted beets, and hummus strewn with whole chickpeas and roasted pumpkin seeds, slick with chilli oil. Juicy chicken shish tawook with a tiny side of garlic sauce disappears in a blink. The kofta go just as quickly. 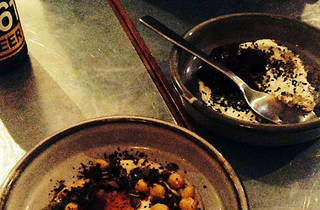 Here they’re lean meatballs with a nice char, served on a bed of smoky eggplant dip bejewelled with pomegranate seeds. Both dishes make a great excuse to smash a few 961s - a crisp, slightly bitter and highly sessionable Lebanese beer. A very small salad of red cabbage, mint and aged cheese sweetened with plump, golden raisins lends some brightness to the dishes we order, which have a tendency to be a little heavy and one-dimensional, despite all those fruits, seeds and spices. Deep-fried dumplings filled with ricotta and drizzled in butterscotch are fine, but by no means essential. Here’s the thing: if you’re used to eating at traditional Middle Eastern restaurants where the plating is family-sized, you might leave feeling less than wowed by the generosity. One member of our party jokes that he’s seen garnishes bigger than some of the dishes at restaurants in Lakemba. Chic Pea’s not cheap (the hummus alone is $12 for a non-huge portion; if you want bread, it’s $2.50 a puck) but there’s some polish and verve here to the plating that you won’t find out west. There’s fun to be had here – just take some pals, and be sure to order double.